I was tagged by Kristi at Music Mom of 2 (ages ago) for the 4x4 Meme. I was excited because it was a simple meme that I could do quickly. I long to come up with quick posts lately (which I'm sure you can understand). Unfortunately it ended up not quite working out as a "simple" post. So then I was all set to post the picture and tell the story... except I told Nick that my post would be something along the lines of "My husband Nick likes beer." He said there was so much more of a story and was not happy with my version. So he started telling me all about what I should write and I finally said "If you don't like my version then maybe you should write the post yourself." And Nick (shockingly) said "Well fine, I will." So without further ado... Nick will post for the first time ever on my blog. Maybe if it goes well we'll do it again? My friend Jeff and I write, record, and play music together, mostly in the basement. We are also beer geeks and drink a fair amount of American micro-brew and European classic beer. In the spirit of the juvenile nature of the man room we also collect the bottles of the better beers we drink. When we run out of room I try to take pictures of the bottles of the good-but-not-amazing beer before recycling them. 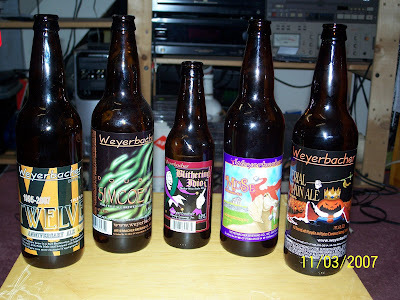 This picture is of a Weyerbacher (Easter, PA) collection. Fitting for the fall season, on the far right, is Weyerbacher's Imperial Pumpkin Ale, which is one of the best spiced pumpkin beers I've had. One has to be careful though, it's 8% alcohol. Another fantastic pumpkin beer is Southern Tier's Pumking. I prefer it because it has no spices in it. My current favorite USA brewers are Stone (Escondidio, CA), Southern Tier (Lakewood, NY) - particularly the big bottles, and Dogfish Head (Rehoboth Beach/Milton, DE). My favorite beer is Sierra Nevada (Chico, CA) Pale Ale. I can't wait to see what happens to be your 4x4!! !